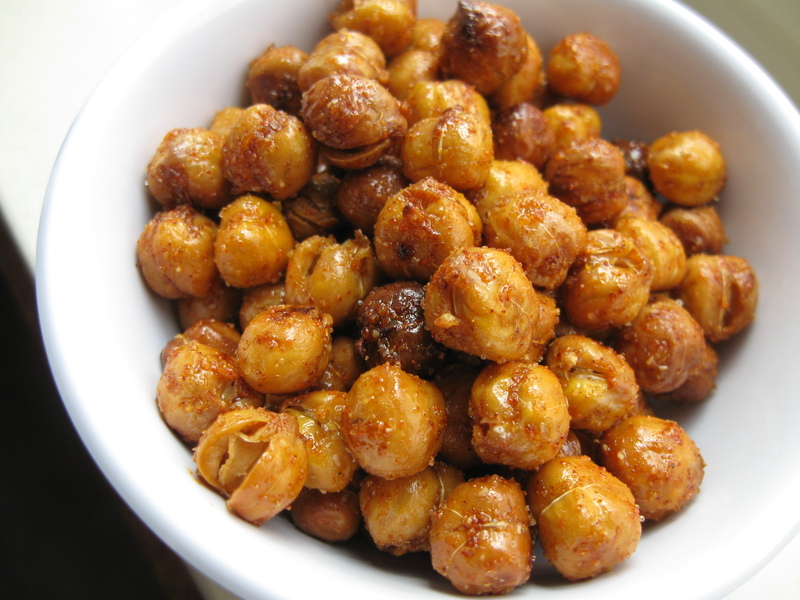 Roasted Chickpeas – Addictively Crunchy! I ran across this snack recipe recently while visiting Reini Days. The Jilb (host of Reini Days) shared photos of incredibly tasty-looking roasted chickpeas (or garbanzo beans, as they’re sometimes called). She profiled spiced, honey and sweet and salty variations, and while all three were appetizing, I found the spicy version particularly so. I followed the simple recipe she provided to find out for myself whether they taste as good as they look. I ate half of the addictively crunchy and flavorful (but not fiery) peas at once. Just as well, since the Jilb advises they are best consumed within 24 hours after making them. The good news is, you CAN consume lots of these low-fat, high-fiber, protein-packed peas without guilt. *Note: I’ve seen variations of this recipe that call for coating the chickpeas in the oil and seasoning mixture prior to baking, which should work just as well and may produce a slightly drier texture. I really could not quit eating them. And I bought another can of chickpeas on my next grocery trip so I could have them on hand to make more! I will have to try this recipe, Karen. I tried one recipe before but they were mushy and not crunchy at all. Believe me…mushy wasn’t good. Glad to have your recipe. It is a nice change from the typical snacks! Wow … That’s great being able to use the canned variety. I have to try this! Yes, super simple to put together!